Helping you create times of worship that connect with a range of abilities, this is an essential resource for leaders of diverse Churches. This vital resource draws on the vast experience of the L'Arche community to offer practical guidance and ideas for imaginative worship that engages people with learning and other disabilities. It explores the essential considerations of pastoral work with those with learning disabilities, as well as patterns of prayer and worship that are most appropriate. It offers practical ideas for enabling participation and building familiarity while keeping worship fresh and varied, with ready-to-use themed service outlines for use throughout the Christian year. It offers a compendium of resources for creating your own acts of worship, including prayers, blessings, stories, quotes, a directory of online resources, ideas for what to keep in a 'liturgy box', ideas for seasonal decoration of the worship space and many more resources from L'Arche. 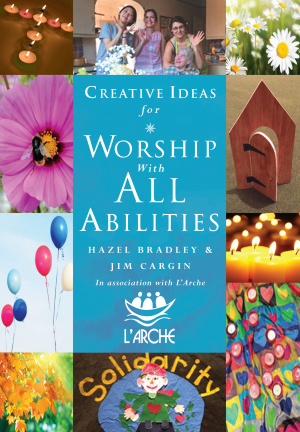 Creative Ideas For Worship With All Abilities by Hazel Bradley, Jim Cargin was published by Canterbury Press Norwich in April 2019 and is our 4934th best seller. The ISBN for Creative Ideas For Worship With All Abilities is 9781786221193. Be the first to review Creative Ideas For Worship With All Abilities! Got a question? No problem! Just click here to ask us about Creative Ideas For Worship With All Abilities.